Director/Screenplay – Brian T. Jaynes, Producers – Brian T. Jaynes & Kerri Navarro, Photography – Samuel Haun & M.J. Marcinik, Special Effects – C. Michael Jaynes & Erin Volkman, Production Design – Ryan Laepple. Production Company – Hannover House/Lionshare Pictures. Jonathan Wright and his fiancee Jenna Barnes wake in the morning to go to Gem Labs, the agricultural research laboratory where both of them work and he is the director of the facility. Jonathan seems distant from the plans for their wedding. What Jenna is not telling him is that she is pregnant. As they settle into their workday, they are interrupted by the emergency alarms going off. The doors are sealed and everybody is locked into the laboratory. As Jonathan determines to find the cause, they are forced to fight off the infected who have become insane killers. He confesses to Jenna that they are not working in an agricultural research facility as she has been led to believe but that Gem Labs is a front for the Department of Defense. He reveals that have been employed to develop a virus that makes people frenziedly kill everybody they come into contact with and this has now been accidentally released. They are now forced to fight for their lives against the infected crazies inside the facility, while at the same time must now also deal with the arrival of the military who have orders to eliminate every single person inside the quarantine zone. 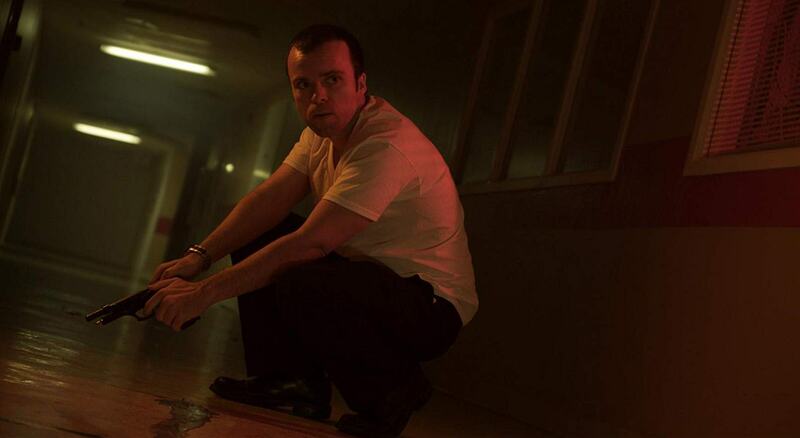 Patient Zero is a variation on the outbreak drama. The idea of the bioweapon/contamination outbreak that causes everybody to go crazy dates back to George Romero’s original The Crazies (1973) and has played out in a number of other films. In fact, Patient Zero often reminds a good deal of the forgotten and overlooked Warning Sign (1985) about a viral outbreak at a bioresearch facility that turns the staff uncontrollably homicidal. That is to say, it plays as a far more lower-budgeted version of Warning Sign – and one that has been more than clearly drawn from the recent success of 28 Days Later (2002). The one thing you have to commend director Brian T. Jaynes for is that he gives the appearance of having gone away and researched his biological and laboratory procedures and makes these seem convincing. The main problem Patient Zero has is that Jaynes does nothing remarkable with the scenes of the outbreak, people being attacked by crazed infectees and the attempts to escape the facility. The scenes with the military eliminating everybody have a certain ruthlessness but you cannot help but feel that if the film had been made on a studio budget these scenes would have been given played out for a dramatic intensity. Indeed, the film seems to invest more in the everyday scenes between Brandon Slagle and his fiancee Amanda Phillips than it does the action/horror element. The finished film hails in at a surprisingly short 68 minutes. The film should not be confused with the later, better-budgeted Patient Zero (2018) about people infected with a rabies plague. Brian T. Jaynes has made a number of other low-budget films as director and producer. He has directed other genre items such as Boggy Creek (2010), Humans vs Zombies (2011), The Underneath (2013), Bigfoot Wars (2014) and Shadow People (2017), as well as produced Hostage (2013), Jet Stream (2013), Supercollider (2013) and Dead Sea (2014). His lead actor Brandon Slagle has also directed a number of films including Area 51 Confidential (2011), The Black Dahlia Haunting (2012), Dead Sea and House of Manson (2014).